Background : The frequency of leucine-rich repeat kinase 2 (LRRK2) G2019S mutation, the most common genetic cause of Parkinson's disease (PD), shows significant variation based on ethnicity. Earlier reports suggest a very low frequency or absence of this mutation in Asians. Objective : To analyze the frequency of LRRK2 G2019S mutation in sporadic and familial cases of PD and normal controls of common ethnicity from South India. Patients and Methods : We used direct sequencing technique of all DNA samples in a clinic-based study of sporadic (n = 100) and familial PD patients (n = 86 index cases) and normal controls (n = 100) of common ethnicity from South India. Results : None among the patients or controls had the G2019S mutation. Conclusion : The founding events that influenced a number of other populations/ethnicities had no impact on the genetic makeup of PD patients from South India. Our findings support the current view that G2019S-associated PD may be population-specific. This has implications in genetic testing for PD and selection of subjects for potential future gene-based therapeutic trials for G2019S carriers in such populations. 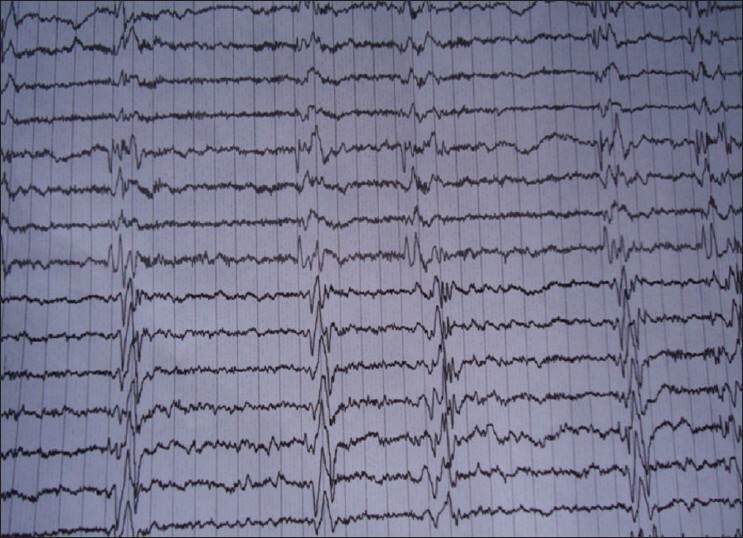 Background and Objective : Cerebral vasospasm is a serious complication of subarachnoid hemorrhage (SAH) and is associated with clinical deterioration and mortality. The objective of this study is to investigate the effect of continuous intravertebral artery (cIVA) injection of fasudil hydrochloride on delayed cerebral vasospasm (CVS). Material and Methods : Forty white rabbits were alloted into groups: (i) seven-day (cIVA injection of fasudil hydrochloride for seven days after injection of blood) group, (ii) five-day (cIVA injection of fasudil hydrochloride for five days from the third day after injection of blood) group, (iii) intravenous treatment (intravenous infusion of fasudil hydrochloride after the first blood injection twice a day) group, and (iv) control group. All the rabbits in all the four groups underwent selective vertebrobasilar angiography. The pathological changes in the basal artery were observed by light and electron microscopy. Fasudil hydrochloride injection (2ml:30mg) was provided by Tianjin Chase Sun Pharmaceutical Company Limited. Results : Severe CVS occurred after subarachnoid hemorrhage (SAH) in the control group, whereas, it was significantly lower after intravertebral artery and intravenous injection of fasudil hydrochloride. 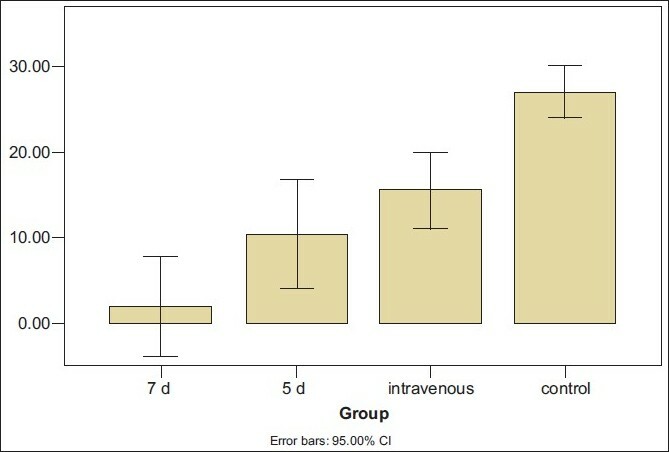 The difference between the intravenous and intravertebral artery groups was statistically significant on the seventh day. Conclusions : The effect of cIVA injection of fasudil hydrochloride in treating delayed CVS due to SAH at different time points was better than intravenous administration. Aim : To compare diffusion tensor image (DTI) study in association fiber tracts among normal control (NC), amnestic mild cognitive impairment (aMCI) and Alzheimer's disease (AD) subjects. To assess diagnostic value of DTI in aMCI and differential diagnosis of DTI study between aMCI and AD. Material and Methods : DTI was used to assess changes in cerebral association fiber tracts in NC, aMCI, and AD subjects (n = 20/group). Regions of interest included the inferior fronto-occipital fascicles (IFOF), superior longitudinal fascicles and cingulum tract, genu of corpus callosum (Gcc) was set right, splenium of corpus callosum was set left. Bilateral fractional anisotropy (FA) and apparent diffusion coefficient values were compared in three groups. Results : Relative to NC, aMCI subjects had significantly different FA values for the IFOF and cingulum tract, while AD subjects had significantly different FA values of IFOF, Gcc, and cingulum tract. Relative to aMCI, AD subjects had significantly different FA values of cingulum tract. Conclusion : Based on the results, DTI could be used as a diagnostic method for aMCI with abnormal changes in IFOF and cingulum tract. DTI could also be used for differential diagnosis of aMCI and AD by comparing FA values of the cingulum tract. Abnormal FA values of IFOF, Gcc, and cingulum tract in AD patients may help to elucidate the pathological processes in this disease. Background : We aimed to investigate gender differences in Turkish stroke patients. Material and Methods : Demographics, risk factors, clinical and etiologic subtypes, laboratory findings, clinical course, and in-hospital prognosis of 1 522 patients with ischemic stroke (IS) and 320 patients with intracerebral hemorrhage prospectively registered in the Istanbul Medical School Stroke Registry (1994-2004) were analyzed separately. Results : The mean age of IS patients was higher in females (n : 751) (P<0.0001). 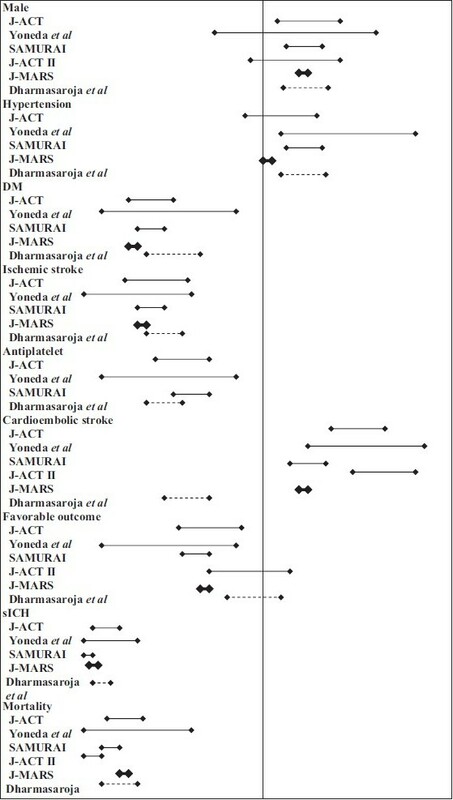 In males, smoking, ischemic heart disease, peripheral arterial disease, posterior circulation syndromes, and strokes due to large-artery atherosclerosis were more common (P<0.0001 for each). Prestroke disability, atrial fibrillation (P<0.0001), hypertension (P=0.041), modified Rankin Scale (mRS) 3-5 at admission (P<0.0001), total anterior circulation syndrome (P<0.0001), and cardioembolic stroke (P<0.0001) were more frequent in females. Female gender was an independent predictor of poor outcome (mRS 3-6). Conclusion : Gender differences were observed exclusively in patients with IS. Although our patients were younger than those reported, gender differences were similar. Background : Intravenous recombinant tissue plasminogen activator (rtPA) has been approved to treat eligible patients with acute ischemic stroke within 4.5 hours of onset. The rationale for using a lower dose in Asian patients came from concerns about intracerebral hemorrhage because of the racial differences in blood coagulation-fibrinolysis factors. Aim : The aim of this systemic review was to compare the data from previous studies to address the efficacy and safety of using low-dose vs standard-dose rtPA in treating patients with acute ischemic stroke. Material and Methods : Previous studies were searched and analyzed. The confidence interval was calculated at 95%. Baseline characteristics and outcomes of the patients were compared between two doses of rtPA (0.6 vs 0.9 mg/kg), using Z test for two independent proportions. Results : Patients who received standard-dose rtPA had significantly higher favorable outcome at 3 months (33.1 vs 47.2%, P<0.0001), without significant difference in the rates of symptomatic intracerebral hemorrhage (3.5 vs 4.3%, P = 0.42) and mortality (13.1 vs 11.7%, P = 0.56). However, patients in the low-dose group were older and had more severe stroke. Conclusions : Patients receiving standard-dose rtPA seem to have higher rates of favorable outcome. However, there were significant differences in baseline characteristics between the two groups. A further, well-designed, randomized study in the same population is still needed to clarify the suspected benefit of the standard dose for East Asian patients. Background : Depression, anxiety, cognitive impairment, sleep disturbances are common neuropsychiatric manifestations in Parkinson's disease (PD). Aims : To compare the prevalence and severity of depression in PD with a group of patients with other chronic medical illnesses and ascertain the relationship of depression with disability and quality of life in PD. Settings and Design : Hospital-based prospective case-control study. Patients and Methods : Forty-six PD patients and 30 non-PD controls having chronic medical conditions were studied. All were assessed by Beck Depression Inventory (BDI) and Montgomery Asberg Depression Rating Scale (MADRS), World Health Organization Disability Assessment Schedule (WHODAS II) and World Health Organization Quality of Life Scale-Brief Version (WHOQOL-Bref). Statistical Analysis Used : SPSS Version 13.0 was used for analysis which included descriptive tests, independent t test, chi-square test, Fisher's exact test, and Pearson's correlation coefficient. Results : The prevalence of depression was higher and more severe in PD than controls (MADRS: 54.3% vs 23.3%, P<0.01; BDI 49.9% vs 23.4%, P<0.05). PD patients had significantly greater overall disability than controls (36.8±19.4 vs 15.1±15.4; P<0.001), and the difference was observed in all six domains of WHODAS II. Conclusions : PD patients had inferior quality of life than controls in all four spheres of WHOQOL-Bref. In PD, depression correlated positively with various domains of disability (P<0.001) and negatively with quality of life (P<0.001). In summary, the prevalence and severity of depression is significantly higher in PD than can be explained by chronic illness. Depression plays an important role in determining the disability and quality of life. 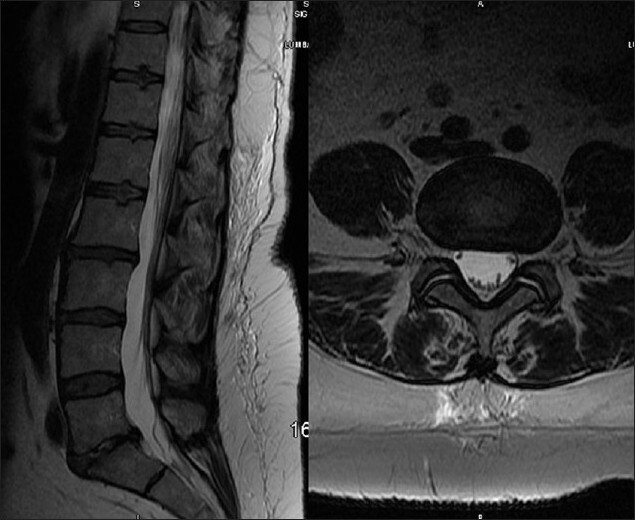 Background : We present our findings concerning the laterocavernous sinus (LCS) drainage of cavernous region dural fistulas, focusing our attention on the anatomy of LCS as it may have important implications in the treatment. Patients and Methods : Thirty-one consecutive patients with cavernous region dural fistulas treated endovascularly between 2005 and 2008 were reviewed. Five patients had angiographic features such as cavernous region dural fistulas draining with superficial middle cerebral vein (SMCV) via LCS. Clinical records of these 5 patients were focused upon to determine their presenting symptoms, angiographic features, endovascular treatments and clinical outcomes. Results : Among 31 cases of cavernous dural arteriovenous fistula (DAVF), 5 (16%) cases with leptomeningeal veins [SMCV, petrosal vein] reflux via LCS were noted. The 5 cavernous region dural fistulas were defined as Cognard type III and Barrow type A (1/5), B (1/5), C (1/5) and D (2/5). All 5 patients underwent immediate obliteration of the cavernous region dural fistulas in 3 sessions of transarterial and 2 sessions of transvenous embolization. An angiographic obliteration and clinical cure was achieved in all patients. We encountered one minor complication of local hair loss induced by X-ray radiation. A complete resolution of the initial presenting symptoms was observed within a few days to weeks. 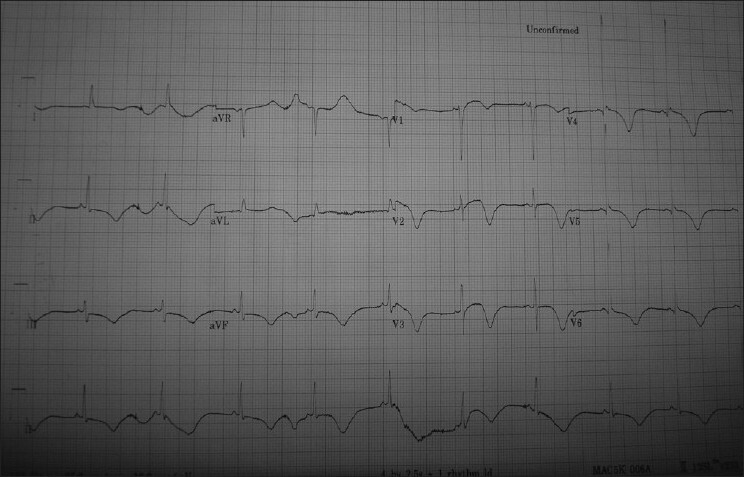 Six-month follow-up angiogram in 5 patients showed obliteration and no recanalization of CCF. Conclusion : It is very important to diagnose the presence of laterocavernous sinus in dural arteriovenous fistulas during diagnostic angiography. It is believed that the knowledge of the existence of laterocavernous sinus might be relevant for the understanding and treatment of dural fistulas involving the cavernous sinus and its lateral wall. Introduction : Meningitis is the most dreaded cause of morbidity and mortality in neurosurgical patients. The reported incidence of postoperative meningitis is quite varied 0.5-8%. Material and Methods : The study cohort included all the patients who underwent neurosurgery at the department of neurosurgery, National Institute of Mental Health and Neurological Sciences, Bangalore, India over a period of seven years (2001 - 2007). Patients with culture positive meningitis were included for analysis. The incidence of postoperative meningitis was analyzed depending on the type of surgery performed and the microbiological profile of the organisms, and their sensitivity pattern. Results : Of the 18,092 patients who underwent neurosurgical procedures during the study period, 415 patients developed infection. The overall incidence of meningitis was 2.2%. The incidence of meningitis was high (7.7%) in patients who had a pre-existing infection like post-pyogenic meningitis or tuberculosis hydrocephalus. The procedure mainly performed in this subgroup was shunt. The most common organisms causing meningitis were non-lactose fermenting Gram-negative bacillus followed by Pseudomonas and Klebsiella species. The methicillin-resistant Staphylococcus aureus strains were isolated in 2.6% of the patients. Ninety-one strains were multi-drug resistant, among which four strains were resistant to all antibiotics tested. The overall mortality in patients with meningitis was 5%. Conclusion : Meningitis remains one of the most dreaded complications of neurosurgical procedures and is common in patients with preexisting infection. Gram-negative organisms are the most common causative pathogens of postoperative meningitis. 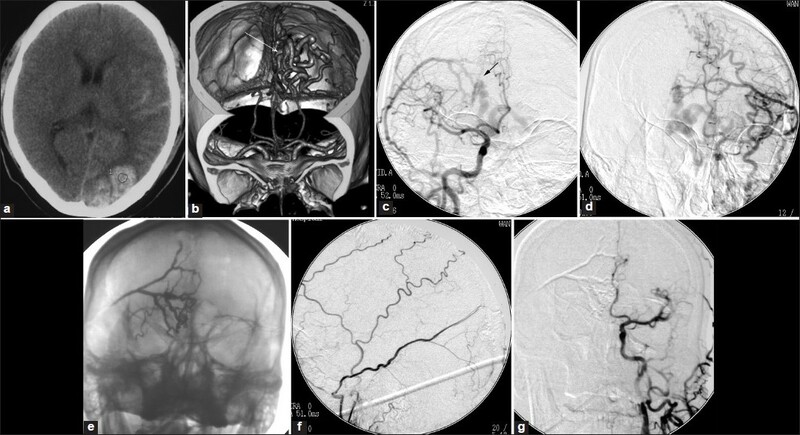 Background : Digital subtraction angiography (DSA) and magnetic resonance angiography are the imaging modalities for the detection of intracranial arteriovenous malformations. However, these modalities are time consuming and cannot be used in emergency conditions. 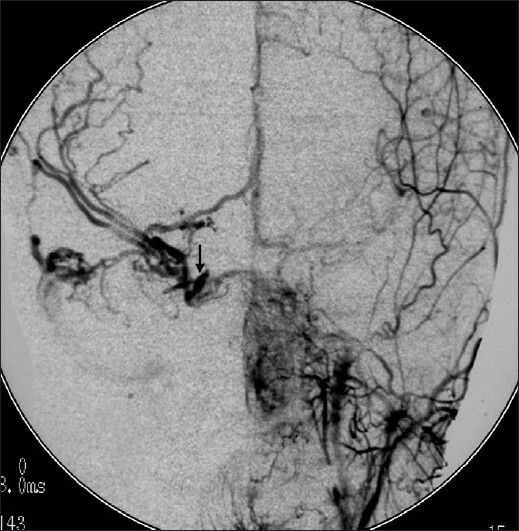 Computed tomography angiography (CTA) has also been shown to reliably detect vascular disorders such as cerebral arteriovenous malformations (AVMs). Aims : The purpose of this study was to evaluate the usefulness CTA in the surgical treatment of AVMs and the hematoma evacuation. 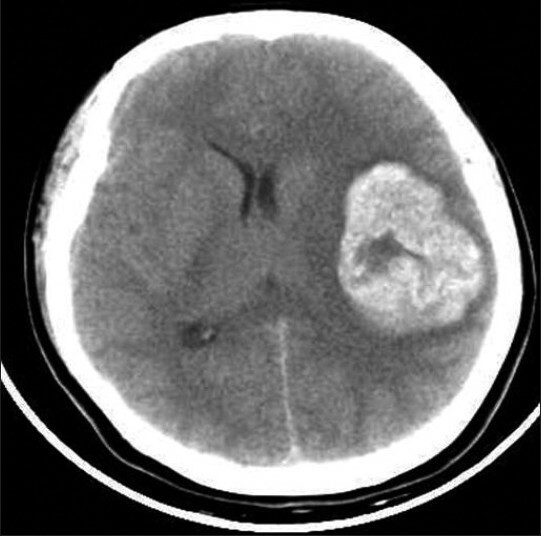 Patients and Methods : Case records of 18 patients with massive intracranial hematoma secondary to AVMs were retrospectively reviewed. All patients had emergent brain CT and CTA. Follow-up DSA was performed two to three weeks after surgery. The outcome was assessed using Glasgow Outcome Scale (GOS). Results : Emergent CTA demonstrated AVMs and defined the feeding arteries, abnormal vascular nest, and draining veins in all the patients. Fourteen patients underwent hematoma evacuation and total resection of the AVMs, and four patients had hematoma evacuation and a partial resection. Follow-up DSA demonstrated complete resection of AVM in 14/18 patients and partial resection in 4 patients. There were no deaths and none of the patients had rebleeding in the follow up. A GOS scores during follow-up were: GOS 3 in 12 patients, GOS 4 in 4 patients and GOS 2 in 2 patients. Conclusions : CTA can be a reliable and rapid diagnostic tool for detecting underlying AVM in patients presenting with intracranial hematoma and for the pretreatment planning of emergency craniotomy. Background : Meningiomas are slow-growing tumors. 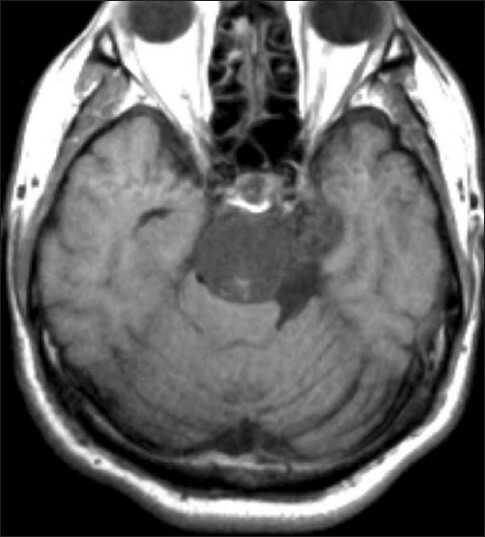 Grading of meningiomas based on histological features has certain limitations in predicting the exact biological behavior, necessitating ancillary techniques. Objective : To study the Ki67 labeling index (Ki67 LI) in various histological subtypes and grades of meningioma and correlate it with various parameters for recurrence. Material and Methods : All intracranial and intraspinal meningiomas diagnosed between 2005 and 2008 were graded according to WHO 2007 criteria. Immunohistochemistry was performed using Ki67 (Dako, USA 1:50) in 300 cases. Statistical analysis was performed. Results : There was female predominance. The age ranged from 2-75 years including 11 children below the age of 18 years. There were 211 Grade I, 78 Grade II and 11 Grade III meningiomas. The mean Ki67 LI increased from Grade I to II and from Grade II to III and these were statistically significant. The Ki67 LI was high for the subtypes of clear cell, chordoid, papillary and rhabdoid but there was no statistical significance between the subtypes. The difference in Ki67 LI between recurrent versus non-recurrent and brain-invasive versus non-invasive meningiomas was statistically significant. Conclusion : High Ki67 LI indicates higher grade of meningioma. The difference in KI67 LI between recurrent and non-recurrent meningiomas was statistically significant. Background : Till date there is no published multi-institutional data regarding the epidemiological profile of pediatric brain tumors in India. Aim : The present retrospective study analyses the histological spectrum of pediatric age group brain tumors in seven tertiary care hospitals in India. Material and Methods : Data regarding frequencies of various primary brain tumors (diagnosed according to the World Health Organization (WHO) classification), in 3936 pediatric patients (<18 yrs of age), was collected from seven tertiary care hospitals in India.Results : The most common primary pediatric brain tumors were astrocytic tumors (34.7%), followed by medulloblastoma and supratentorial primitive neuro-ectodermal tumors (22.4%), craniopharyngiomas (10.2%) and ependymal tumors (9.8%). The most common astrocytic tumor was pilocytic astrocytoma. In comparison to adults, oligodendrogliomas and lymphomas were rare in children. Conclusions : Our study is the first such report on the histological spectrum of brain tumors in children in India. Except for a slightly higher frequency of craniopharyngiomas, the histological profile of pediatric brain tumors in India is similar to that reported in the Western literature. Background : Management of patients with poor-grade aneurysmal subarachnoid hemorrhage (SAH) is difficult and the protocols followed differ from center to center. Material and Methods : In this report, we present our experience with aneurysmal clipping in patients with poor-grade SAH. Patients with poor Hunt and Hess (H and H) grade (Grade IV and Grade V) were offered surgery after stabilization of their hemodynamic and metabolic parameters. The status was recorded as favorable (good recovery, mild to moderate disability but independent), unfavorable (severe disability, vegetative) and dead. Results : Out of a total of 1196 patients who underwent aneurysmal clipping, 165(13.8%) were in poor grade. Of the 165 patients, 99 (60%) were in H and H Grade IV and 66 (40%) were in Grade V. More than half of the patients (58%) were operated within 24 h of admission. There was an overall mortality of 50.9%. In the long term, of the survivors who were followed up, about 72% achieved a favorable outcome. Conclusions : With an aggressive approach aimed at early clipping, the chances of rebleed are reduced and vasospasm can be managed more aggressively. This protocol resulted in survival in a significant proportion of patients who would have otherwise died. In the long-term follow-up, the surviving patients showed significant improvement from the status at discharge. Background : There have been significant advances in the technical aspects of endovascular therapy of cerebral aneurysms. Anterior communicating artery (Acom A) aneurysms were traditionally treated by surgical clipping. Endovascular coiling has the distinct advantage of being minimally invasive and can be performed anytime during the course of subarachnoid hemorrhage (SAH). Aims : To evaluate the results of endovascular coiling of Acom A aneurysms in the early post-rupture period. 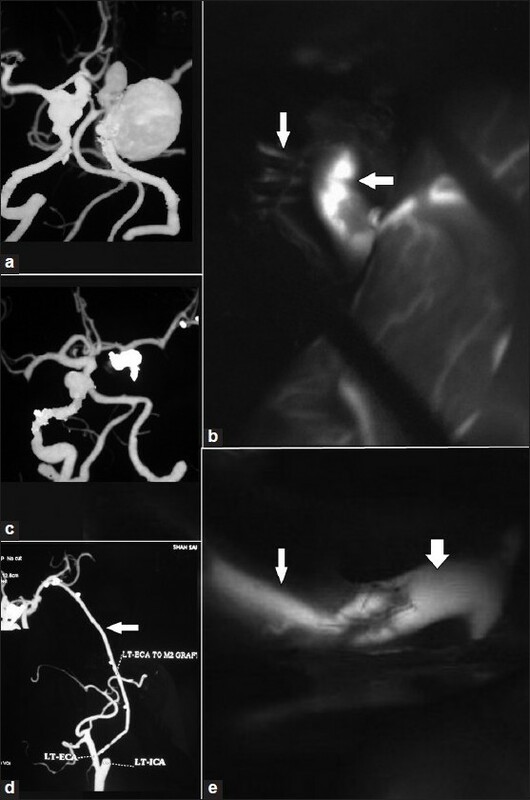 Material and Methods : Between June 1999 and December 2009, 103 Acom A aneurysms were treated with endovascular coiling. All the patients underwent digital subtraction angiography (DSA) and a diagnostic 3D rotational angiogram (3D-RA), followed by coiling using dedicated intracranial coils. Results : Of the 103 patients coiled, 52% presented in Fischer grade 3/4 SAH and 13.5% in Hunt and Hess grade 4/5. Technical success was 98%. Complete obliteration of the aneurysm was achieved in 97 (94%) patients. Only one patient died of direct procedure-related complication due to coil prolapse. None of the patients had rebleeds. Six-month check angiogram performed in 34 patients showed significant recanalization in one patient. Conclusion : Ruptured Acom A aneurysms are implicated in majority of cases of SAH. Our results support the latest guideline "that endovascular coil occlusion of the aneurysm is appropriate for patients with a ruptured cerebral artery aneurysm that is deemed treatable either by endovascular coiling or by surgical clipping." Assessment of promoter methylation of the O 6 -methylguanine DNA methyltransferase (MGMT) gene has recently gained importance in molecular profiling of high-grade gliomas. It has emerged not only as an important prognostic marker but also as a predictive marker for response to temozolomide in patients with newly diagnosed glioblastoma. Further, recent studies indicate that MGMT promoter methylation has strong prognostic relevance even in anaplastic (grade III) gliomas, irrespective of therapy (chemotherapy or radiotherapy). This article provides an overview of its use as a predictive and prognostic biomarker, as well as the methods employed for its assessment and use in therapeutic decision making. Background: Glioblastoma multiforme (GBM) is a highly malignant central nervous system tumor that is extremely refractory to therapy due to its rapid growth and local invasive potential. The ability of glioma cells to invade the surrounding tissue has been attributed to the expression of matrix metalloproteinase-2 (MMP-2) in human gliomas. The -1306C/T polymorphism in the MMP-2 gene has been found to be associated with gastric adenocarcinoma, lung cancer and various other cancers including GBM. Racial and ethnic variations are known in such genetic polymorphisms. Aims: This prospective, case control study was aimed to find out an association of MMP-2 gene polymorphism with susceptibility to develop glioblastoma in Indian population. Material and Methods: MMP-2 gene polymorphism was studied using polymerase chain reaction-restriction fragment length polymorphism (PCR-RFLP) in 110 GBM patients and 150 healthy controls. The SPSS 17.0 statistical software (Chicago, IL, USA) was used for data management and analysis Results and Conclusions: A significant association of MMP-2 (−1306C/T) polymorphism with GBM (P = 0.475) was not found, suggesting that MMP-2 (−1306C/T) polymorphism is not associated with increased GBM susceptibility. Aims and Background: Glioma is difficult to treat and despite advances, outcomes remain poor and new treatment modalities are required. We studied the inhibitive effects of human umbilical cord blood-derived mesenchymal stem cells (UCB-MSCs) on glioma growth. Material and Methods: UCB-MSCs were identified in mice by flow cytometric analysis, and neurogenic differentiation by immunohistochemistry. C6 cells were injected subcutaneously into the posterior right flank of each mouse. Dil-labeled UCB-MSCs were administrated by intravenous (IV) or intratumoral (IT) injection. Tumor blood vessel density was detected by counting the number of CD34-positive cells with endothelial morphology. Cyclin D1 protein expression was detected by immunohistochemistry and Western blot analysis. Results: A 26% reduction in overall tumor volume was observed after IV UCB-MSCs treatment, 36% in animals who received IT UCB-MSCs. UCB-MSC administration was associated with reduced neovascularization. We identified a 48% and 27% reduction in the number of cyclin D1-positive cells in mouse glioma tissues treated with UCB-MSCs IV and IT, respectively. Conclusion: We demonstrated that UCB-MSCs potently inhibit glioma growth, reduce neovascularization, and decrease cyclin D1 protein expression in vivo. IV or IT UCB-MSC administration significantly inhibits glioma growth, and may represent a promising new therapy. Background: Low-grade diffuse astrocytoma (DA) is considered benign tumor (World Health Organization [WHO] grade II), but it has an inherent tendency for malignant progression, which is quite variable. 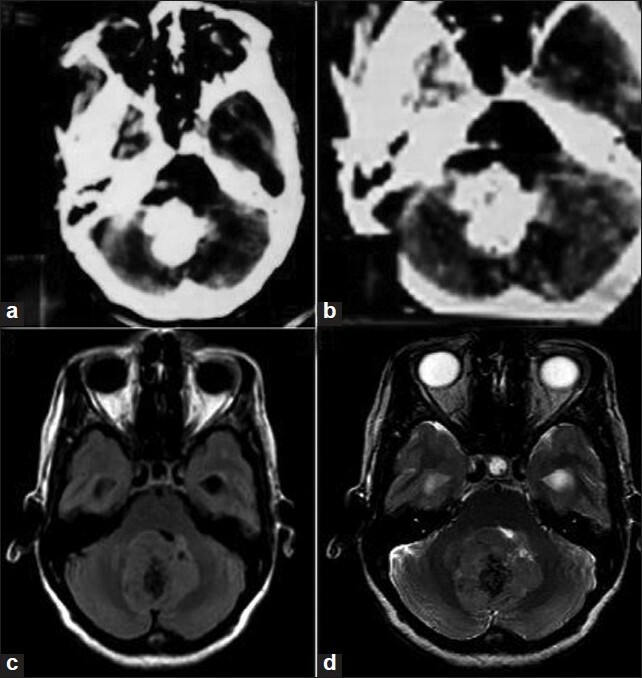 Aim: To identify malignant progression in an individual case of DA, we studied the clinico-radiological and immunohistochemical factors and correlated with progression of DA at a dedicated tertiary level neurosciences centre NIMHANS, Bangalore, India. Patients and Methods: Consecutive adult patients who had undergone tumor decompression for lobar supratentorial DA at our institute from 1994 to 1998 were retrospectively selected and followed up for clinico-radiological progression. The clinico-radiological and histomorphological features were studied. With the use of immunohistochemistry, proliferation index [MIB-1 labeling index (LI)], p53 protein expression, microvessel density (MVD) count [assessed using anti-CD34 antibody] were analyzed and correlated with progression-free survival (PFS) Results: There were 13 patients. Mean age was 34 years. The most common presenting symptom was seizures. The median follow-up was 54 months. There were four recurrences, with median interval of 75 months. Eight patients received radiotherapy. Younger patients (<40 years), seizure as the presenting symptom and postoperative radiotherapy were associated with longer PFS, while gemistocytic morphology (>20% gemistocytic cells), MVD value >20 correlated with shorter PFS, albeit statistically insignificant. MIB1 LI did not correlate with recurrence pattern. Moreover, p53 LI > 10% correlated with early progression (P = 0.04). Conclusion: Our study highlights some of the clinical, histological and immunohistochemical parameters that predict progression on DA. Validation on a larger sample may be useful to plan appropriate treatment in an individual case. 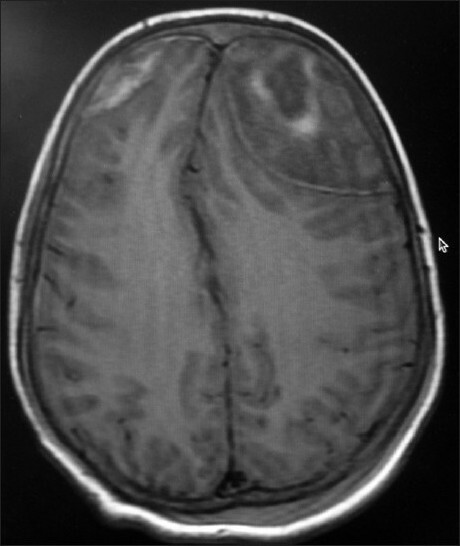 Background: Glioblastoma multiforme (GBM) is the most common malignant central nervous system neoplasm. Loss of heterozygosity (LOH) on chromosome 10q in these tumors has been found to show variable association with prognosis. Aim: To evaluate LOH 10q status in cases of GBM, and to correlate these results with patient characteristics, other genetic alterations, and survival. Material and Methods: Fresh tumor tissue and blood samples were obtained for 25 cases of GBM diagnosed over a 2-year period. LOH 10q assay was performed on blood and tumor DNA by a PCR-based method using four microsatellite markers. TP53 mutation analysis and fluorescence in situ hybridization for epidermal growth factor receptor (EGFR) were performed. Histopathology was reviewed and clinical data were analyzed. Results: LOH 10q was identified in 17 of 25 cases (68%). Losses were frequent with markers D10S1765 (12/20 informative cases; 60%) and D10S587 (12/17 informative cases; 70.5%) in the regions of 10q23.3 and 10q26.1, respectively. D10S540 for 10q25.1 showed LOH in 4/12 informative cases (33.3%) and D10S1770 for 10q26-ter in none of the 25 cases. LOH with D10S1765 at the PTEN gene locus was found to correlate with overall LOH 10q status (P = 0.001). LOH 10q was more common in patients older than 40 years (16/19, 84.2%) than in those below (1/6, 16.7%) (P = 0.006). One of three pediatric patients included demonstrated LOH 10q. Survival rates for patients with LOH were lower than for patients with retained heterozygosity. Conclusion: LOH 10q is a frequent genetic abnormality in GBM in Indian patients, is seen more frequently in older adults, and its presence is associated with shorter survival. The single best marker to determine LOH 10q status is D10S1765 at the PTEN region. We report four patients (1 woman and 3 men) with sagittal sinus dural arteriovenous fistulae (DAVF) treated by Onyx embolizations via the middle meningeal artery. Anatomic cure and clinical cure were achieved in all the patients. The fistulae were located in the middle and posterior parts of the sagittal sinus. By Cognard classification the fistulae were: type I - one, type IIb - one, and type IV -two. All these four patients underwent a clinical and angiography follow-up, which confirmed complete cure. 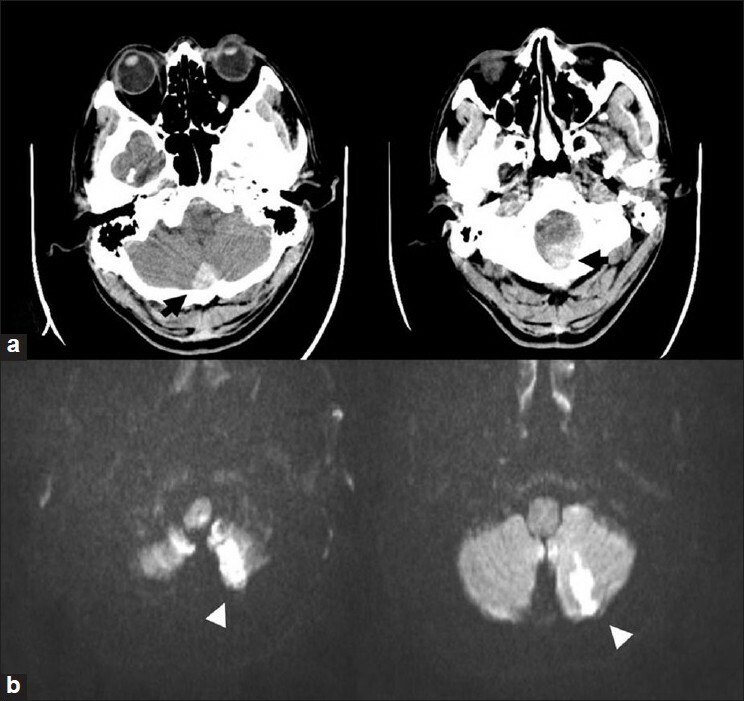 Based on this experience, we hypothesize that sagittal sinus DAVFs can be cured using a transarterial endovascular approach. 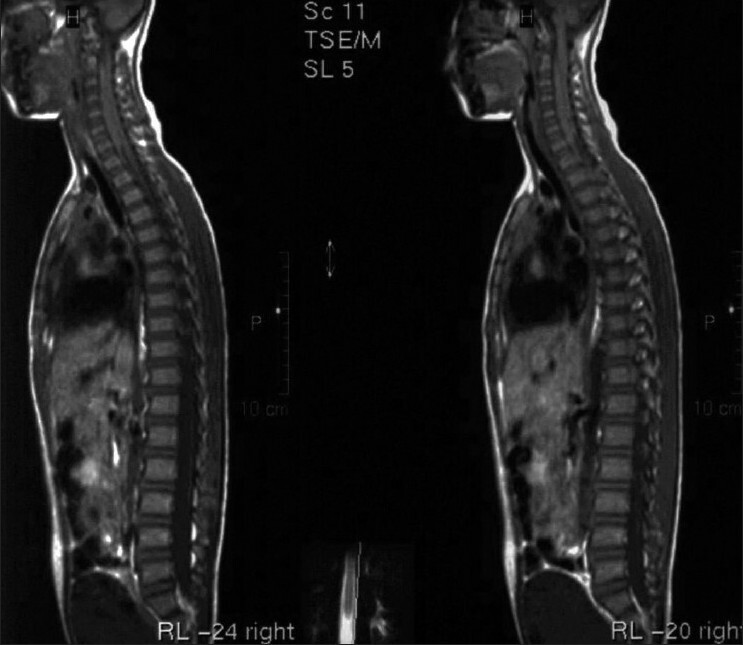 A "Hot Cross Bun" sign on T2-weighted MRI was described as a result of selective loss of myelinated transverse pontocerebellar fibers and neurons in the pontine raphe with preservation of the pontine tegmentum and corticospinal tracts (CST). However, neuropathologic studies showed contradicting results with no sparing of the CST. This is a pictorial and quantitative demonstration of the sign on diffusion tensor imaging and tractography, which provides the imaging evidence that is consistent with neuropathologic findings. 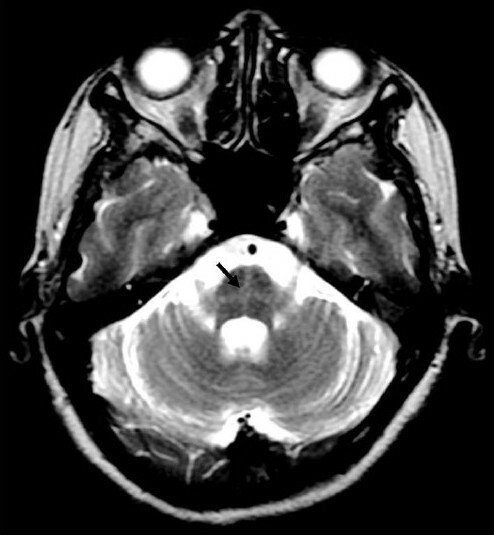 We describe MRI findings in a fatal case of culture proven Salmonella typhi-associated encephalopathy. MRI findings included symmetrical diffuse abnormal signal in centrum semiovale, periventricular and deep white matter, splenium of corpus callosum and cerebellar deep white matter with central area of restricted diffusion. There was no contrast enhancement, significant edema or mass effect. Previous literature is also reviewed for imaging findings in Salmonella associated encephalopathy. The parieto-occipital region of the brain is most frequently and severely affected in subacute sclerosing panencephalitis (SSPE). The basal ganglia, cerebellum and corpus callosum are less commonly involved. Brainstem involvement is rarely described in SSPE, and usually there is involvement of other regions of the brain. 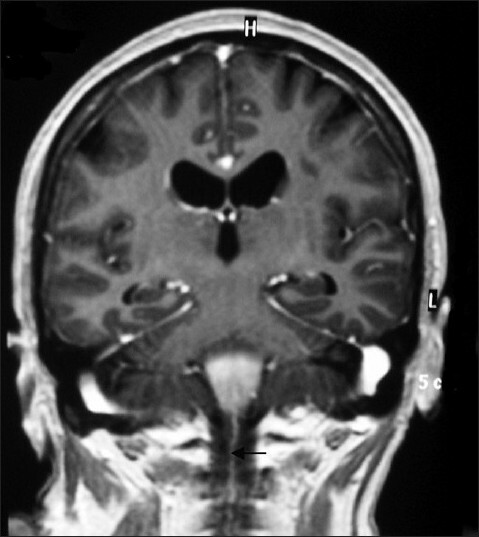 We describe a patient with subacute sclerosing panencephalitis with brain magnetic resonance imaging showing extensive brainstem involvement without significant involvement of other cortical structures. Though rarely described in SSPE, one should be aware of such brainstem and cerebellum involvement, and SSPE should be kept in mind when brainstem signal changes are seen in brain MRI with or without involvement of other regions of brain to avoid erroneous reporting. Rosette-forming glioneuronal tumor, a mixed glial and neuronal tumor, is a relatively new entity in tumors of the central nervous system, included in 2007 classification published by World Health Organization (WHO). It was initially described to occur in and around the fourth ventricle; however, recent case series have reported other locations also. Their occurrence in supratentorial and spinal locations has recently been reported. 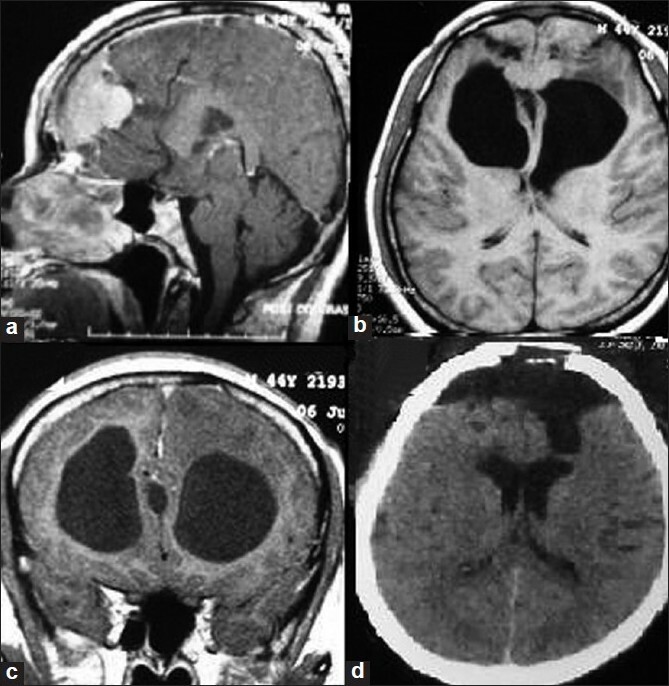 We report two cases of rosette-forming glioneuronal tumors, one in the midbrain and one in a suprasellar location, and review the literature. Spinal subdural hematoma (SDH) following a cranial surgery is extremely rare. 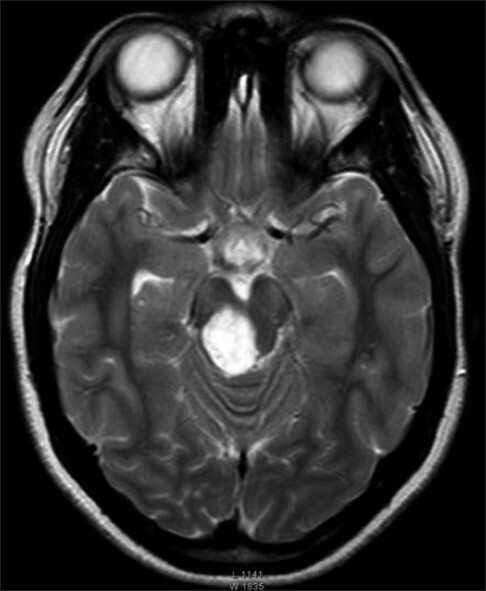 We described a 26-year-old patient who developed an SDH at L3-S1 level after the excision of intraventricular meningioma. He was surgically treated with an excellent outcome. 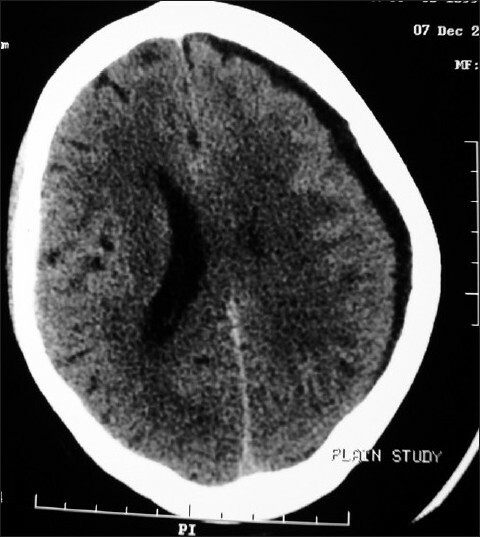 It is postulated that the SDH resulted from downward migration of intracranial hematoma. 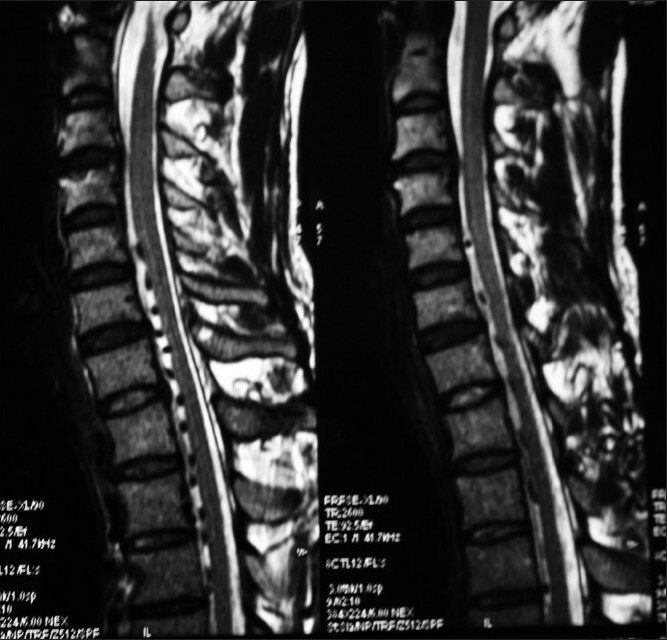 A 58-year-old woman with cervicomedullary dural arteriovenous fistula (AVF) presenting with myelopathy, ipsilateral occipital neuralgia, and signs of involvement of the brainstem is reported and the previously published cases have been reviewed. The dural AVF was successfully treated surgically after an attempt of embolization. Transsellar transsphenoidal encephalocele is the least common type of basal encephalocele. We present a series of four cases of transsellar transsphenoidal encephalocele. 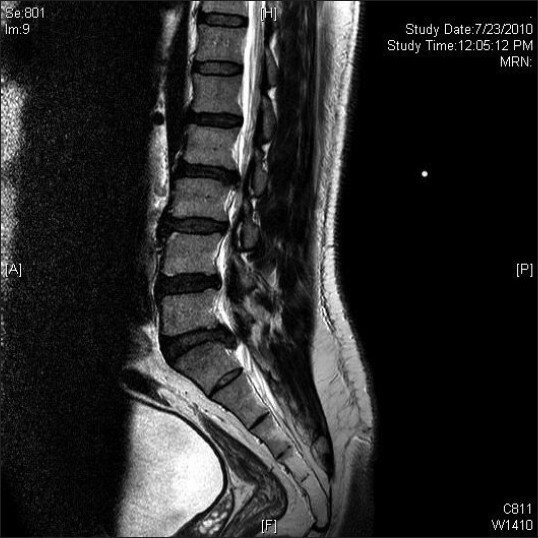 Clinical findings, imaging reviews, surgical repair techniques and postoperative morbidity are discussed with the relevant literature. Non contrast CT scan head with 3D reconstruction and magnetic resonance imaging should be done in all patients of transsphenoidal encephalocele. Endocrine assessment is also essential. Repair of a transsphenoidal encephalocele should be coordinated between a team of neurosurgeons and ENT surgeon. Our surgical outcome supports the transpalatal/ transnasal approach over the transcranial approach.